Win a Post Shredded Wheat Prize Pack! 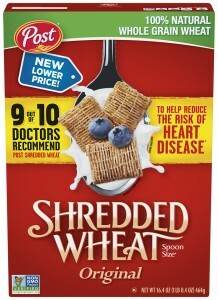 In honor of heart health month, we’re giving away a prize pack of Post Shredded Wheat to 5 lucky AppforHealth.com fans. Let us know in the comments below one step you’re taking to make your eating habits healthier. Extra credit will be given to those who share our content with their social media networks. Enter by midnight, March 1, 2015. * Based on an online survey of 400 physicians conducted by Wakefield Research between August 28 and September 14, 2014, using an email invitation and online survey. Results of any sample are subject to sampling variation. The magnitude of the variation is measurable and is affected by the number of interviews and the level of the percentages expressing the results. For the interviews conducted in this particular study, the chances are 95 in 100 that a survey result does not vary, plus or minus, by more than 4.9 percentage points from the result that would be obtained if interviews had been conducted with all persons in the universe represented by the sample. **Diets low in saturated fat and cholesterol, and as low as possible in trans fat, may reduce the risk of heart disease. I am trying to eat at least 5 servings of fruits and vegetables a day. I am working on eating smaller portions. I usually eat healthy but tend to eat large portions. Small portions will mean less calories. Measuring and weighing takes time but is worth it. I am cutting out red meat and sweets to make my eating habits healthier. I am trying to eat better foods like eating more whole-grain cereals. i eat this cereal regularly with fresh blueberries, strawberries and blackberries are great right now. I use almond milk which has no sugar. Its a great “after Crossfit” reward..I have sent your page to all in my address book. We had fog this morning in the Florida Keys. Reminded me of those cool foggy Marin County mornings.. i try to stay away from most packaged foods and hit the local fruit stand. Have a Great DAy!! We are eating almost all whole foods cooked at home with very few exceptions. Made of whole at with no sugar makes Shredded Wheat a great fit for our diet. I get your newsletter and like you on facebook. I also shared your article entitled, “Do you need to bulletproof your coffee?” on twitter. Here is the link: https://twitter.com/icalledonjesus/status/570636506638888961 My husband and I are trying to change our eating habits to be healthier and a few things we are doing is first off, trying not to bring “unhealthy foods” into the house. We find if we have them we will eat them. But, we also found we must replace the unhealthy with healthy. So we are buying more healthy foods so that when we feel we need a snack we have something good to eat. We are also trying to juice at least once daily. We especially love carrot juice first thing in the morning. Thank you for this great giveaway! I’m trying to drink more water and walk more. I am incorporating a lot more fruits and veggies in my diet and starting exercising again!! I’m trying to drink more water and eat several smaller meals throughout the day. I shop for organic and non gmo produce. I am trying to up my intake of fruits and veggies. Apples have become my best friend again. Eating lots of greens and making sure to drink plenty of water. I am already a subscriber and like AFH on FB. We are loading up on veggies lately. Our plates have more color than not! Drinking more water (with lemon) and eating more vegetables and fruits. I plan on replacing my white flour with whole grain flour and eating more fruit. I’m doing my best to stop eating after 9pm. I am a grazer, so its often eat from 6-10 when i go to bed. Need to stop that! I’m trying not to snack on empty calories. I’m trying to snack on fruits & vegetables & nuts instead of junk food! I’ve been trying to eat at least 30 g of fiber a day. Slowly but surely I’m going to reach that goal. I’m mixing fruits and vegetables into juices to make a healthy drink. It’s much easier to drink your fruits & veggies rather than eat them, plus the whole family really loves the variety of many different juices we can make. Incorporating more veggies and fruits into my meals. I eat smaller portions; mostly fruits and vegetables. I’m eating whole grains, nuts and beans so I have “slow carbs” to balance out other healthy foods. Trying to eat more veggies instead of so much fruit. Avoiding processed foods and anything out with high sodium. Love the fiber content and would love to pair this with the new “cashew milk” Silk recently released. Shared on Facebook! I have been buying more fruits and veggies and having them around in the kitchen so that we all eat healthier by choosing more of them. I take a couple of bottles of water and an apple to work by doing that I have to eat better everyday. I eat fruit every morning and don’t snack between meals. I’ve cut our red meat and a ton of sugar. Also eating more fruits and veggies. I eat Shredded Wheat or greek yogurt everyday for breakfast. I am adding more fiber to my diet, including Shredded Wheat! I have been cutting back my sugar, like eating plain yogurt instead of flavored. I have been loading up the fruits and veggies and eating more whole grains!! I am trying to eat smaller amounts of food at a time, but eat more often so I do not become too hungry and keep my blood sugar at a good level. I do follow on FB as Maryann Drapkin and I am a subscriber. I am eating clean and feel so Awesome! Been eating more fruit with my morning cereal. Reducing sugar consumption by forgoing more desserts, and eating <=100 calorie greek yogurt. Congrats to Joe, Joan, Ebonie, Lucy and Janet! You have won the Post Shredded Wheat prize pack and will be receiving an email with instructions on how to claim your prize shortly.